a) Whenever a video is uploaded a notification to this effect is sent on the subscriber's email. b) All Videos related to Narration of personal experience of Param Pujya Bapu's grace (Anubhav Kathan) can be viewed from a Central location. 2) On the upper right hand corner, click on create account if you wish to create a new account or sign in using your existing account. Note that you can use your Gmail ID to login to YouTube. 4) Click on Subscribe button to subscribe to the channel. 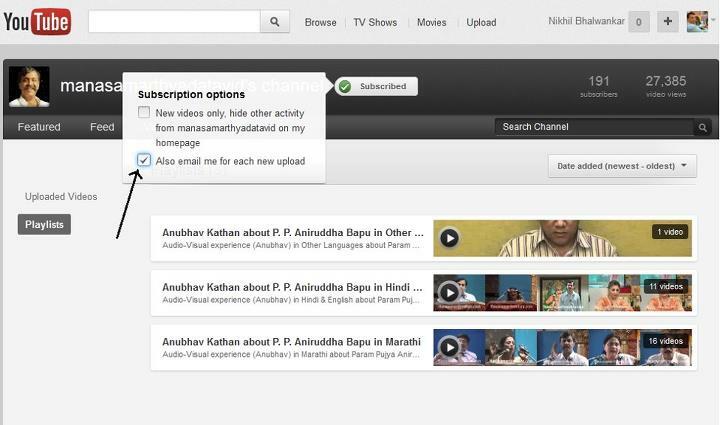 5) After subscribing, click on videos tab and then select Playlist. Videos according to languages are available as Playlists here. 6) Move your mouse pointer over the Subscribed button. Don't click on the button. You will see a small pop-up window which has 2 checkboxes. Click on 2nd checkbox. By clicking on this checkbox, you can get notification on your email for each new video upload. 2) The link will open the YouTube Login page as below. Provide your login details. 3) After login, the below page will open up. 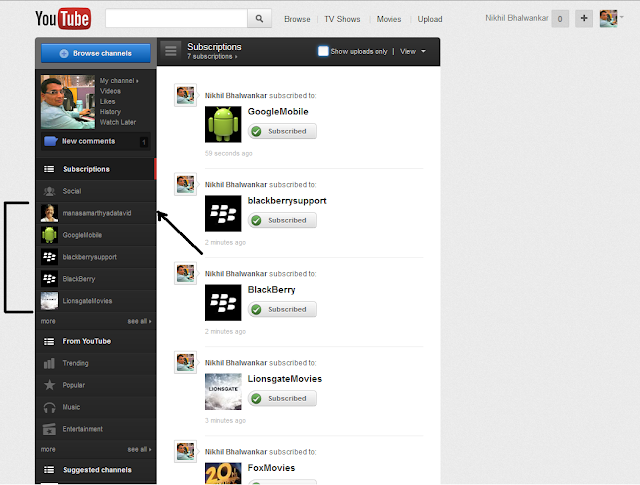 The left hand side center will provide the list of channels to which you have subscribed. 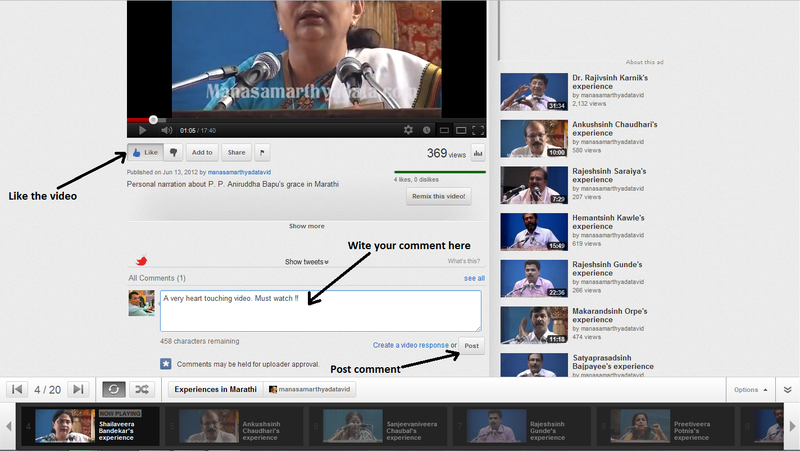 Click on manasamarthyadatavid to access the desired video channel. Other part shows the what activity you have done after login to YouTube. 4) The page showing activities going on Aniruddha Bapu Videos channel will be displayed on this page. 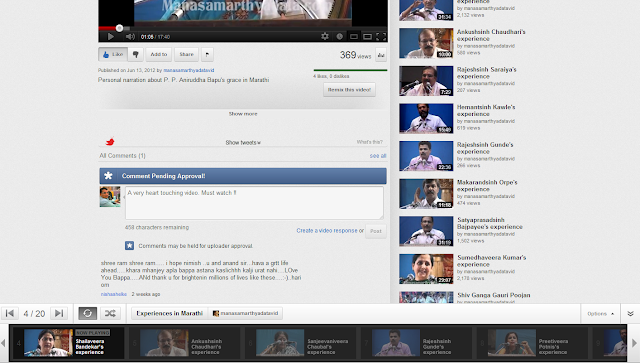 (i)You can click on individual links near the video to watch the videos without visiting the channel's home page. (ii) You can click on View channel link to visit the channel's home page and then decide which video needs to be viewed according to the playlists created. 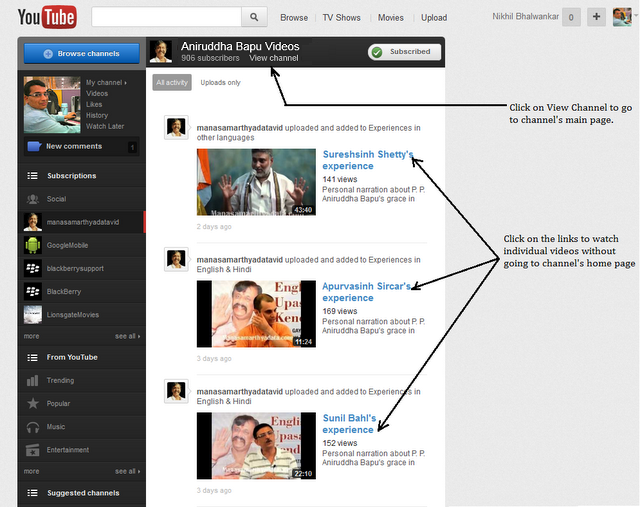 5) After clicking on View channel link, channel's home page will be displayed as below. Click on Videos link and the click on Playlists link as shown by the arrows below. The use of playlist is to distinguish the videos according to the languages. You can click on individual playlist to view the videos uploaded in that particular playlist. 6) Taking the example of Marathi, click on the link Experiences In Marathi. The below page displays all the videos which are part of the playlist Experiences In Marathi. Click on individual video links to watch the videos. Also, click on Like button which means you like the playlist created. 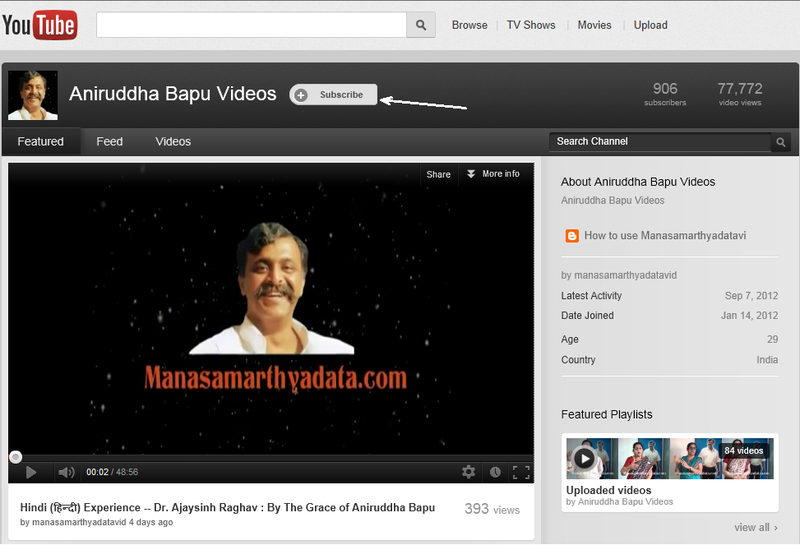 The arrow on the right side shows the total number of playlists created in Aniruddha Bapu Videos channel. Clicking on it will open the page shown in point no. 6 above. 2) Now in the search bar, type Aniruddha Bapu Videos and click on search icon. 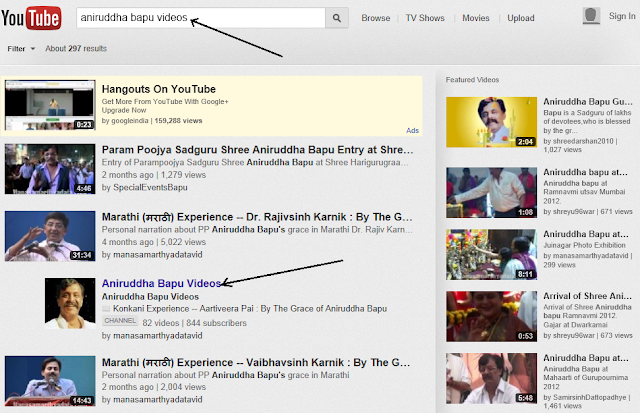 Performing this action will search for the keyword Aniruddha Bapu Videos and will display the search results. 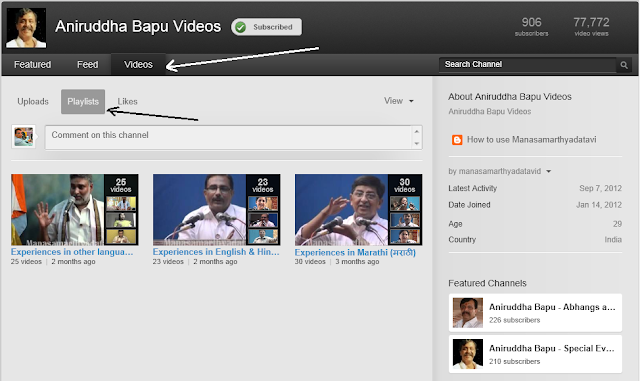 Select the Aniruddha Bapu Videos link as shown by the arrow below to visit the channel's home page. 3) Clicking on the link will display the home page. Click on Videos tab and then click on Playlist tab. Now you can choose the videos to view according to playlists. 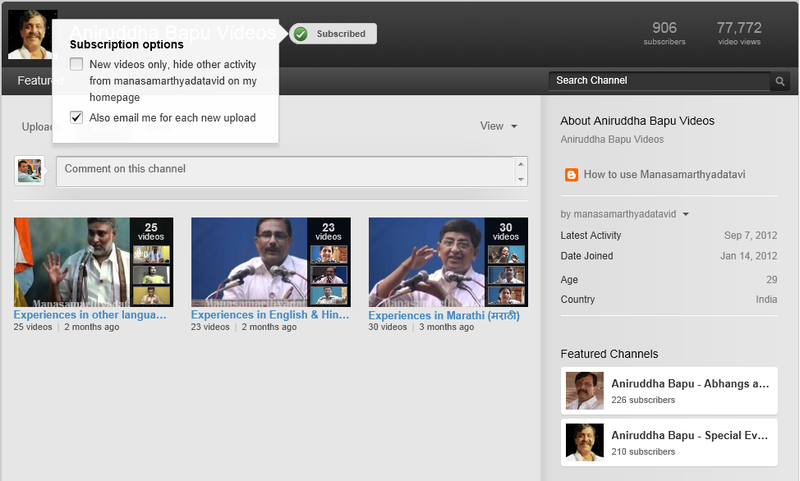 After login to youtube, youtube allows you to provide your comments and feedback on the videos uploaded. You can also like the video and share it with your friends. More number of video views, likes and comments helps in popularizing the videos. The more popular the video is, there are more chances of the video to appear in most of the related search results. Note:- We will take the example of Method-1 shown above. The point no. 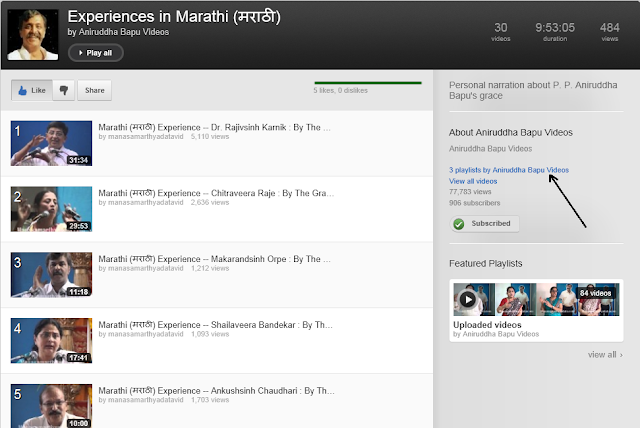 7 shows Experience In Marathi playlist. Click on any of the video. Lets say Shailaveera Bandekar's experience. 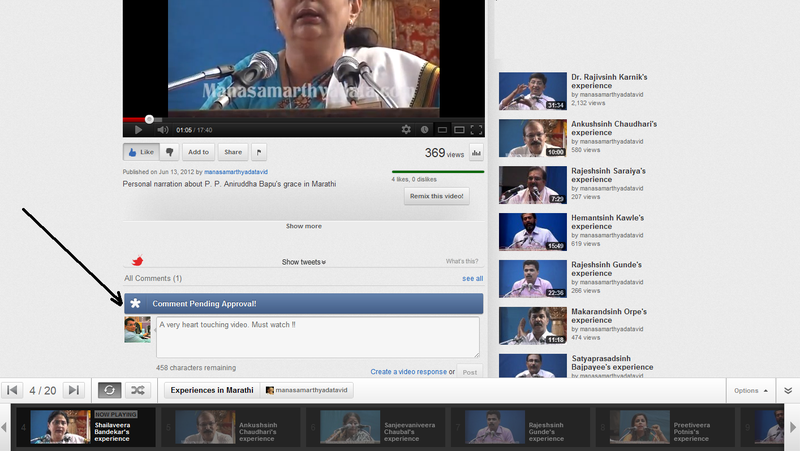 1) Click on the video Shailaveera Bandekar's experience. Below page will open. (i) Click Like button. This means you liked the video. (ii) You can put your comments in the white colored textbox as shown by the arrow. Then click on Post. This will submit your comment. 2) The comment posted will not be visible on the spot. It will be first submitted to the manasamarthyadavid channel's administrators to verify. Once the verification gets completed, the comment will be visible. 3) The comment will be visible as shown in the below image once approved. The same procedure can be followed for all other videos present in multiple Playlists.